On Monday morning, the Supreme Court handed down its decision on a much-anticipated case that involved the often polarizing issues of religious liberty and L.G.B.T. rights. At the same time, more than 150 Catholic leaders were gathered across town at Georgetown University’s Riggs Library for a three-day conference on how Catholics might resist polarization within their church and, perhaps, in the political arena. The timing of the Masterpiece Cakeshop decision seemed almost providential, providing more fodder for discussion among Catholics split over religious liberty, L.G.B.T. rights, the role of courts and more. But the myriad issues that polarize Catholics were largely set aside at the conference in an effort, perhaps, to focus on dialogue about dialogue. The organizers—John Carr, who directed the Catholic bishops’ social justice office for decades before launching the Initiative on Catholic Social Thought and Public Life at Georgetown in 2013, and Kim Daniels, a lawyer who has focused on religious liberty issues and served as a spokeswoman for Cardinal Timothy Dolan—succeeded in bringing together Catholic leaders from across the political and ecclesial spectrums. The idea was to discuss how to heal divisions that have plagued both the church and the country for many decades. The idea was to discuss how to heal divisions that have plagued both the church and the country for many decades. Participants shared stories about how polarization had affected their work and their lives, digested data on what Catholics think about various social and political questions (they are often in the middle), and talked about political polarization. Many participants told me they enjoyed meeting in person the people they follow, and sometimes spar with, on Twitter. Personal contact alone, some suggested, could reduce some of the polarization in the church. The conference, called “Though Many One: Overcoming Polarization Through Catholic Social Thought,” was hosted by Mr. Carr’s Initiative for Catholic Social Thought and Public Life and included an address from the archbishop of Washington. Cardinal Donald Wuerl navigates differences in both the highest echelons of the church (he was one of the most loyal supporters of Pope Benedict XVI before emerging more recently as a staunch advocate for some of Pope Francis’ more controversial ideas) and in U.S. politics, working with the George W. Bush, Obama and Trump administrations on issues important to the church. He used his time to make a plea for more conciliatory dialogue. “All of us have the responsibility to encourage a far more civil discourse,” he said. “In the church, this should be a given,” he added, perhaps in recognition that this is not always the case. 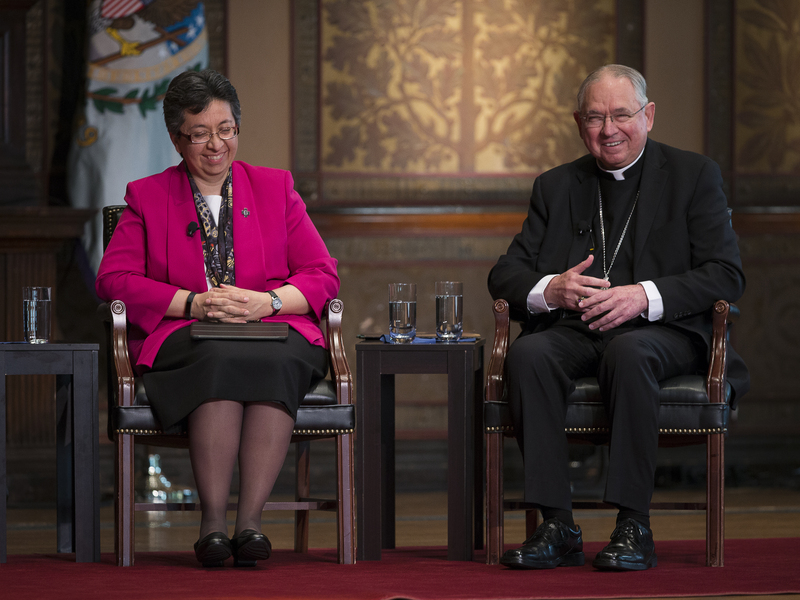 Though organizers never said so explicitly, the choice of Cardinal Blase Cupich and Archbishop José Gomez to serve as co-panelists was a nod to real divisions in priorities that exist among the U.S. hierarchy. Cardinal Cupich, the archbishop of Chicago, is known for his advocacy of stricter gun laws and openness to pastoralism that includes Catholics in nontraditional relationships. Archbishop Gomez, the Mexican-born prelate who leads the Archdiocese of Los Angeles, is a fierce defender of immigrants, but his passion for defending the unborn appears as strong. Norma Pimentel, M.J., recounted her work with migrant children along the U.S.-Mexico border, saying political battles are put aside when confronting a crisis in real time. “When you see life before you, you do what you can to help,” Sister Pimentel said. Norma Pimentel, M.J., recounted her work with migrant children along the U.S.-Mexico border, saying political battles are put aside when confronting a crisis in real time. Bishop Christopher Coyne, the head of the Diocese of Burlington, Vt., said during a homily on the second day of the conference that part of his mission is bridging the divide between older and younger priests, whose pastoral visions are sometimes at odds. “There is so much more that unites us than divides us,” Bishop Coyne said. There were a few mentions of L.G.B.T. issues, among the most polarizing issues in the church today, including a statement from Cardinal Cupich about his decision to stand up for James Martin, S.J., who has been insulted online because of his L.G.B.T. ministry. “If we’re in a position to say something is wrong, I think we should do it,” the cardinal said to much applause. And there were passing references to climate change and health care, but abortion and, to a lesser extent, immigration, got most of the attention at the conference. There were passing references to climate change and health care, but abortion and, to a lesser extent, immigration, got most of the attention at the conference. At times, the message seemed to be that overcoming polarization required Catholics who identify as politically liberal or progressive to care as much about abortion as those who identify as conservative, though movement in the other direction did not seem as pressing. Take a talk from Robert P. George, a professor at Princeton University. “If we are Catholics, we must be fervent pro-lifers,” Mr. George said. He added that Catholics must also be fervently against racism, but he did not extend his rule to other complicated questions with which Catholics wrestle in the political arena. Some speakers suggested laying claim to the political center, which is where U.S. Catholics as a group find themselves today, as the best way to resist polarization. I was invited to the event as a member of the Catholic media, invited to participate and ask questions. I sought out a few participants and asked if they thought events like this one could help bridge the divide that exists in the church and in society. Elise Italiano, who helped facilitate a breakout group discussing millennial Catholics, agreed. And Stephen White, a Catholic studies fellow at the Ethics and Public Policy Center, called the event “an important first step toward tackling polarization,” adding, “that first step is often the hardest to take.” But he wanted more diversity, especially among the conservative participants. “So far as I could tell, the half of American Catholics who actually voted for Donald Trump had very little representation, and that absence marked many of the discussions and panels,” he said. Even if consensus on divisive issues was elusive—and to be fair, finding common ground was not necessarily the goal of the conference—there were some pragmatic next steps offered. One of the most powerful moments of unity during the conference was a noon-time Mass inside Georgetown’s Dahlgren Chapel. Some people gathered there, I know, believe that abortion is murder and that contraception is immoral. Others were openly gay and support marriage rights for themselves and others. For some, immigration is the great moral question of our day, whereas for others, it is religious liberty. But a profound point of agreement was on display. When it came time to distribute Communion, Cardinal Wuerl stepped back. In front of the altar, Cardinal Cupich stood on the right and Archbishop Gomez on the left. One by one, worshippers made their way to the altar. Some, including women in veils, genuflected before receiving the host on their tongues. Others bowed almost imperceptibly before offering their hands to receive the host. But all, when presented with the radical claim “The Body of Christ,” responded in the same way. Until there is agreement on facts, the issues will always be emotional and thus polarized. Also this conference seems to mainly have had one side of the polarizing issues. Also seems like "My way or the highway." Racism is less of an actual issue today than it ever was but race is pointed to as the issue that divides. Why the disconnect? Thank you America, for letting us know what is going on; sincerely, we do need to know. It is apparent that the Catholic left has totally taken over the Church, at least by way of this report. Archbishop Gomez, the "so called" Catholic "conservative" on this panel, supports one of Catholic "progressives' '' signature and most influential meet-ups, aka the Los Angeles Catechetical Congress. It is affectionately dubbed "Three Days of Darkness" by Catholic traditionalists - stocked with the per usual advocates of heterodoxy and the de rigueur "Call to Action" SJW, LBGTQSFX and feminist ideology sold as tantamount to RCC doctrine. And these speakers, who could not have gotten near a RCC podium years ago, are now touted as visionaries and paid handsomely by the same "conservative" Archbishop. Now, to be fair, this whole sham and embarrassment was started by the since publicly shamed purveyor of liturgical mashups and child abuse cover ups and payouts, the now infamous Roger Cardinal Mahony. Well, Archbishop Gemez was going to clean up that mess. Or so went the popular thinking since he was touted as a bona fide RCC "conservative." Well, not so fast; it appears that the Three Days of Wicken feasting really is a cash cow. So much for traddy wishful thinking. The disappointment felt by those same trads for this man is palpable, and there is not much going on West of Barstow to change their minds. IOW, he's hardly their advocate, hardly the model they'd hold up as representing any sort of "conservative" wing of Catholicism. It speaks volumes that all Catholics now have to do to be considered "on the Catholic right" is support human rights, i.e., 'the right to life,' (Which really means that pro death politicians are perfectly welcome to come and have communion with the "stout" advocate for life at the Cathedral, any damn time they'd want, oh, and maybe pick up a SJW award while they're there.... just for fun....Stunning and completely flummoxing. Notice nothing about sexism? Yep. Proof that psychologist are correct. It is the thing you can't discuss (unequitable treatment in Catholicism of all women and its negative effects on the countries around our churches globally) that is always your primary illness and the one that you must deal with most urgently in order to start your healing. Ordain women the same as men, starting with priesthood needs to be what the church body demands from its leaders immediately, or remain a sick and sad, ever weakening church. There is nothing new about very strong differences of opinion within the fellowship of believers in Christ, the incarnate Son of God who has redeemed humankind from the power of sin and death. Those who doubt it need only to read the New Testament all the way through. In it I cannot find any evidence that the people of God still living will once again live in a paradise on earth or are enjoined to build such a paradise. The curse of the fall is still upon us all who are born of woman or the test tube, the curse of Babel has not been lifted either. Both of them however, have been revealed as not intrinsically eternal but have been limited to this side of our own personal individual death through the Cross. So, the burden of male and female being different and complementary while being of one flesh persists and is to be endured under grace and not eliminated this side of the grave and in the same way peoples and tribes and states and nations will differ greatly in language, manners and customs. The followers of Jesus are called out from family, tribe, culture and nation to be set apart as a people gathered for a purpose and part of that is to be a sign of contradiction. We are to dwell in the peace of Christ, not waste time and effort in vain efforts to establish world peace. As far as I can see after 75 years experience of life in the Catholic fold and the wider community, Christians have succeeded in living as if women and men are of equal worth and dignity and that anybody differing by skin colour, dress, language or accent and social customs is still just as much a human as anybody else and themselves. And not a single one of us can rightly lay claim to sinless perfection, not a single solitary male in all human history and only one person, the Hebrew virgin who gave birth to Jesus.
" Some people gathered there, I know, believe that abortion is murder..."
If only some of the Catholic gathered at this meeting believe that then what can be done - who has so mislead the flock of Christ and why are they not being held accountable ?